Anyone in the mood for some escargot? Because my garden has been infested with snails. They ate all my zucchini and squash plants. I've now replanted for the 3rd time. We finally figured out the problem and put down some snail killing stuff. As you can see, I'm real technical with my gardening vocabulary. Anyway, we woke up two days ago to dozens of dead snail along the perimeter of the garden. Yesterday morning there were about 10 more. Yikes...I've become a snail murderer. Hopefully my little garden is safe now. In good garden news, our meal last night included the very first harvest of our herb plants. They seem to be snail free. I love cooking with fresh herbs, and when I can grow them myself it saves me quite a bit of money. Who doesn't love that? 1. Cook the pasta according to the package. Drain the pasta and set aside. 2. In a small bowl combine the cream, egg, and cheese. Whisk and set aside. 3. In a large skillet heat the olive oil. Add the chicken, season with salt & pepper and sauté’ over medium high heat. 4. When the chicken is about half way cooked, add the lemon zest, juice, basil and mint. Finish sautéing until the chicken is done. 5. Turn the heat to medium and add the cream mixture. Stir to combine and cook for 2-3 minutes. 6. Add the cooked pasta and the spinach. 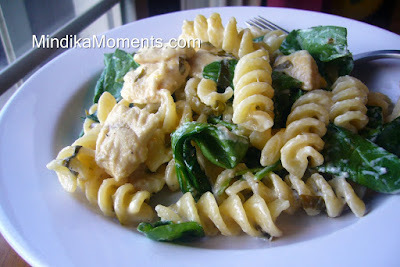 I usually add the spinach about 1 cup at a time, stirring until the spinach wilts into the pasta. 7. Once all the ingredients are combined, serve immediately. Snail killer!!! HAHAHAHAHA and good riddance to the little buggers. On a lighter side, your pasta looks delish and very refreshing. Mmm. Basil. Anything with basil is so good. This pasta is beautiful!